Wesleyan's Campus-CERT team welcomed 17 new members. They are, front row, from left: Kim Krueger, general maintenance mechanic; Doug Brown of the City of Middletown; David Leipziger Teva, director of religious and spiritual life and University Jewish Chaplain; Octavio Flores-Cuadra, adjunct professor of romance languages and literatures; Stacey Phelps, assistant director of Residential Life; Liliana Carrasquillo, area coordinator for Residential Life; Krishna Winston, the Marcus L. Taft Professor of German Language and Literature; and back row, from left: Brian Stewart, chair and associate professor of physics; Doug Allen, assistant to the facilities manager in the Department of Chemistry; Erhard Konerding, documents librarian; Linda Hurteau, library assistant; John Snyder '12; Daniel LaBonte, area coordinator in Residential Life; Krystal-Gayle O'Neill, area coordinator in Residential Life; Noel Garrett, dean for the Class of 2015; and John Maher, residential operations coordinator. Scott Backer, assistant director of student life, is not pictured. “Her name is Sally. She’s bleeding. She’s stuck under a concrete slab and she can’t move her leg,” says Krystal-Gayle O’Neill, area coordinator in Residential Life as she examines a woman trapped under explosion debris. “Let’s get some cribbing material,” suggests Doug Allen, assistant to the facilities manager in the Department of Chemistry. Noel Garrett, dean for the Class of 2015, works to stabilize a victim, played by Joyce Walter, director of the University Health Center. Noel Garrett, dean for the Class of 2015, inserts wood blocks, one at a time, underneath a concrete slab, hoping to stabilize the heavy obstruction. For 15 minutes, the Wesleyan employees worked together and finally rescued Sally from a mock emergency situation. As members of Wesleyan’s Community Emergency Response Team, the employees learn to assist first responders, provide immediate assistance to victims, organize volunteers at a disaster site and improve the safety of the Wesleyan community. 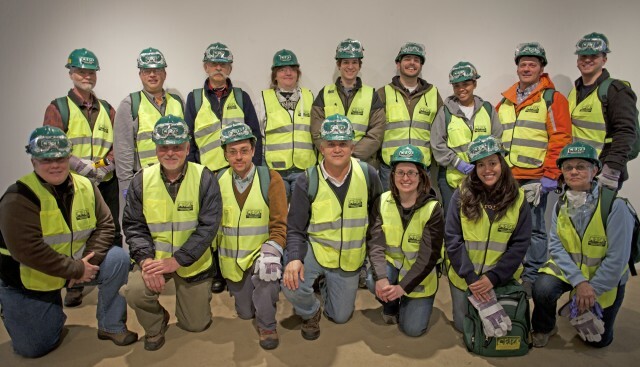 On Jan. 4-6, 12 Wesleyan staff members, three Wesleyan faculty, one student and one Middletown resident participated in 20-hour CERT training. The program included many hands-on activities, including fire extinguishing, locating a victim in the dark, CPR, dressing a wound and extricating a victim from a disaster area. The program, which is supported by a grant from the Department of Emergency Management and Homeland Security, included nine sessions including Disaster Preparedness, Fire Safety and Utility Controls, Disaster Medical Operations Part 1 and 2, Light Search and Rescue Operations, CERT Organization, Disaster Psychology, Terrorism and CERT, a Course Review, Final Exam and Disaster Simulation. 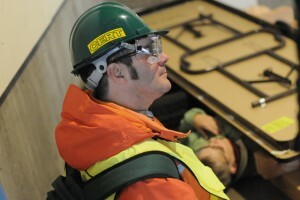 New C-CERT member Brian Stewart participates in a training activity. Participants were equipped with safety equipment such as gloves, goggles, and a mask, and disaster supplies such as bandages, a flashlight and dressings. As an area coordinator in ResLife, O’Neill wanted the knowledge needed to assist her residents and staff members in the event of an emergency. “During the snow storm in October, we were out and about doing fire watches and I was thinking to myself, ‘Man I wish I had some training in this,’ then the opportunity came up to join the CERT team,” she says. Helping others during a crisis is nothing new for Dean Garrett. Immediately following the events on 9/11, Garrett worked at a day clinic proving therapy and triage to anyone in need on Third Avenue in New York City. At the New School, he was director of Student Support and Crisis Management. Garrett, a resident of Portland, Conn. has also spoken to the town’s CERT team about getting placed on their role call. Other new C-CERT members are: John Snyder ’12; Kim Krueger, general maintenance mechanic; David Leipziger Teva, director of religious and spiritual life and University Jewish Chaplain; Octavio Flores-Cuadra, adjunct professor of romance languages and literatures; Stacey Phelps, assistant director of Residential Life; Liliana Carrasquillo, area coordinator for Residential Life; and Krishna Winston, the Marcus L. Taft Professor of German Language and Literature. Also Brian Stewart, chair and associate professor of physics; Erhard Konerding, documents librarian; Linda Hurteau, library assistant; Daniel LaBonte, area coordinator in Residential Life; John Maher, residential operations coordinator and Scott Backer, assistant director of student life. Middletown resident Doug Brown also was certified during Wesleyan’s training. 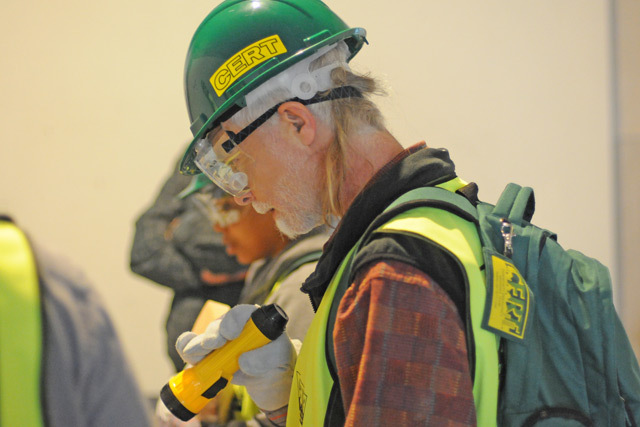 CERT was originally developed by the Los Angeles Fire Department in response to earthquake disasters and later adapted as an “all-hazards” course. 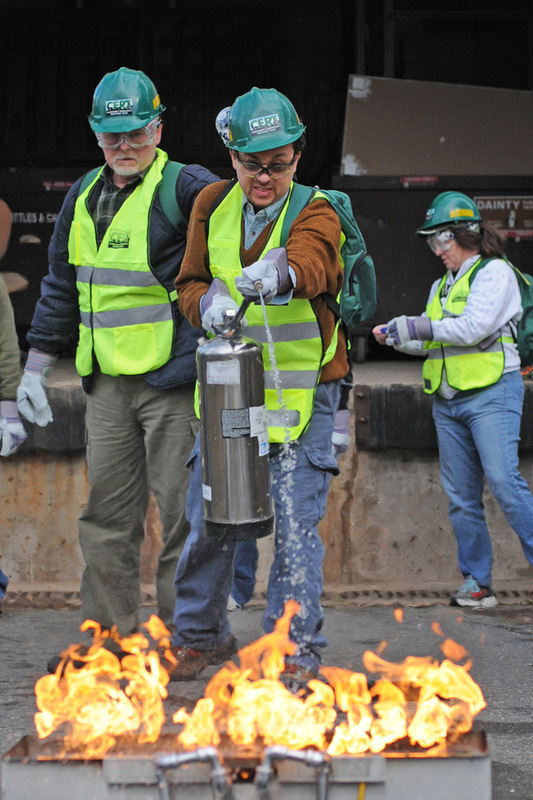 Anyone interested in becoming a Campus CERT member should e-mail Bill Nelligan at wnelligan@wesleyan.edu.